Kevin McNaughton believes Cardiff keeper David Marshall could play for a "top-four or five Premier League" club one day. Marshall has earned rave reviews for his performances this season even though Cardiff are currently in the bottom three. Team-mate McNaughton has hailed Marshall's displays. "I think he'll go on to better things and he'll probably for a top-four, five team in the division," he said. Scotland international Marshall joined Cardiff from Norwich City in 2009 having started his career at Celtic. The 28-year-old signed a new long-term contract in February and has been impressive form during the club's first season in the Premier League. Marshall gave another fine performance as Cardiff won 1-0 at Southampton to boost their hopes of escaping the drop. "We're just buzzing that we've got him here and he's signed an extension and it's great for the club he's playing for Cardiff," fellow Scot McNaughton told BBC Radio Wales Sport. "He's probably just beginning to hit his peak now. He's done a great job and I think he's probably one of the best in the league if not the best. "I can't really see anybody else who's produced the sort of saves he does week in, week out. "I know he's getting tested because we're allowing him to be tested but every time he's asked to make a save he's been brilliant. "But I think he's been doing it over the last two or three years and stepping up to the Premier League is a lot more difficult and he's been class, he's just dealt with everything. "I hope he stays at Cardiff for a long time. The way he's playing at the moment it looks like somebody will probably come and try and nick him off us." 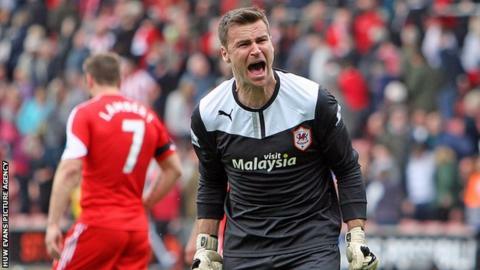 Former England goalkeeper Peter Shilton says Marshall's heroics in goal this season could be enough to keep Cardiff City in the Premier League. "When you're at the bottom of the league it's a lot harder for a keeper obviously than when you are in a side doing well," Shilton said. "You're under pressure week in, week out, the side's not playing well, the defence loses confidence and you've got to be there trying to pick up the pieces and win them games. "Marshall's had a great season and let's just see what happens between now and the end of the season because he's going to play a big part in Cardiff staying up."